During most of the history of our civilization, before modern man's introduction of show standards, the breeds were different from those we know today. Far back, when survival of the fittest was the rule for both man and dog, dogs performed functions crucial to man's survival. Dogs hunted with humans and protected them and their homes from predators and robbers. They guarded caravans and herds, participated in wars, and served as companions. Working ability and health were valued over appearance, and people easily understood a good hunting dog over a bad one. Those dogs perceived to perform better than the rest at hunting or herding, for example, were more likely to be rewarded. As a result, these dogs had a better chance of surviving to mate, so their genes got passed down. Over time, dog behavior was shaped. Breeds that while domesticated are still close in appearance, temperament, and hunting style to the aboriginal (local native) dogs of 15,000 years ago are labeled as primitive. How is a primitive dog different? Those of us who are familiar with many of today's domesticated breeds of dog recognize their keenness for serving humans and find them perceptive to human body movement, from subtle head and eye signals to larger gestures. They imitate humans easily, repeating our gestures, following our lead. Even puppies will look to people for information. At the Department of Ethology at Eötvös Laránd University in Budapest, Dr. Ádám Miklósi and his team have designed experiments to understand how dogs communicate with people. When presented with food placed beyond its reach, a wolf persists in trying to solve the problem on its own until it becomes agitated. On the other hand, a dog readily gives up, and looks to the human for help. 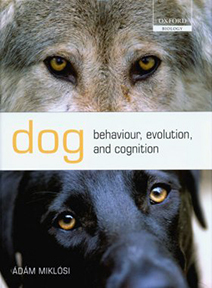 This suggests to Dr. Miklósi that in the course of the evolution of dogs, dogs were selected for this ability. The dog's communicative skills were bred into the animal after it split from the wolf. We rewarded dogs that responded to our social cues. These dogs had a greater chance of surviving and passing on their genes. Just as wolves (from which all dogs descended) look to the pack, dogs look to the pack, but their pack is us. 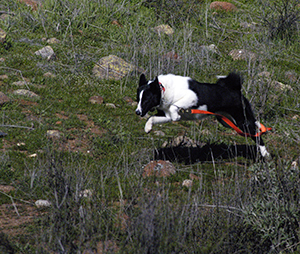 At California Karelians, having watched the Karelian Bear Dog work at solving a variety of challenges, our observations have led us to inferences about Karelian Bear Dog behavior. Even as youngsters, Karelians learn quickly to take cues from us to determine what objective is at hand. It does not take a Karelian long to learn that once they locate a "victim", we want them to return to us and take us back to the victim, a relatively complex exercise. Once given a task to perform, the Karelian Bear Dog seems to possess a drive to solve for itself any problems it encounters. From these behaviors, we infer that domestication has effectively "taught" these dogs how to communicate with humans. Faced with an unexpected obstacle, the dog does not stop in the middle of a task for further instruction but, instead, persists in accomplishing the objective at hand, thinking through the problem and solving it. This focus enables humans to rely on the dog's innate intelligence and instincts to act self-directedly. From this we infer that the Karelian appears to have retained more of its primitive ancestral instincts, passed down from the wolf, than many modern breeds of dog. 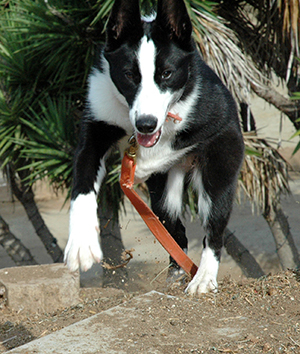 Below, California Karelians' six-month-old Buffy exhibits impressive drive and athleticism. Because of their special natures, today primitive dogs are valued for many reasons. Some value these dogs for their working qualities: they need a dog for guarding animal herds against coyotes, wolves, or other predators. People who live in remote areas may need protection from bears or other predators that share their living spaces. Others enjoy the special companionship of a dog that has been prized and bred over time for its keen natural instincts and innate intelligence. Based on the age of skeletal remains unearthed in Switzerland, At least 2,000 years ago, Viking Age European spitz-type hunting dogs are know to have existed. With their characteristic thick fur, pointed ears and muzzle and tail that curled over the dog's back, spitz-type dogs inhabited Central Europe for millennia and are almost certainly the ancestors of today's Karelian Bear Dogs, based on the similarities in physical characteristics and temperament. Viking Age burials left behind warriors' graves that often contained the bones of one or more dogs, and it is speculated that dogs were included in burials to accompany their master to the afterlife, guiding them to the underworld. True aboriginal (native local) breeds were never thought of as "purebreds". Natives did not worry about variation in the look. They sought a dog that hunted well and was healthy. Top right, here is a picture taken in 1927 Russia, far away from Finland, showing dogs that look remarkably similar to today's Karelian Bear Dogs (photograph provided by Vladimir Beregovoy; photographed by N. P. Naumov, 1927). For the native tribesmen who lived their lives in the cold taiga forest regions just south of the Arctic, mere survival was difficult. Life with primitive dogs helped them to survive. Hunting with dogs allowed the tribesmen to get meat for their families and pelts that could be sold or traded to obtain other goods, such as guns, gun powder, tobacco, tea, and flour. Hunting dogs themselves became an economically valuable commodity that could be traded at trading posts and provincial fairs.